The Daily GRRR! HEADLINES for Mar. 10, 2015. 1. 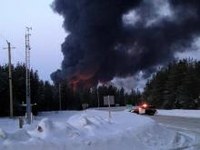 Crude oil crash marks fourth train derailment in Northern Ontario this year. 2. Shale gas industry cites their own “bogus science” in defense of fracking. 3. B.C. First Nation sues prov gov over treaty violations via resource extraction. 4. Environmental protests in Mongolia target Canadian-owned gold mining co. 5. Montreal anti-fascist group organizes counter-action to anti-Muslim demo. 6. Israeli co. responsible for apartheid wall in Palestine given US border contract. 7. KW joins cities across the country for National Day of Action Against Bill C-51. 4. Environmental protests in Mongolia target Canadian-owned gold mining co. The Daily GRRR! is on weekdays from 9-10am on 100.3fm CKMS in Waterloo, Ontario, and http://soundfm.caon the web.